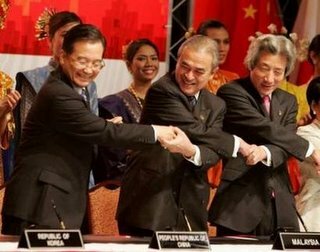 I had been hoping to write something intelligent and insightful to counterbalance my childish labeling of photographs from last week's East Asia Summit. Then my friend BJM sent me the link to this JMSDF recruiting video and my brain melted. You will need to turn up the volume on your speakers for the full effect. 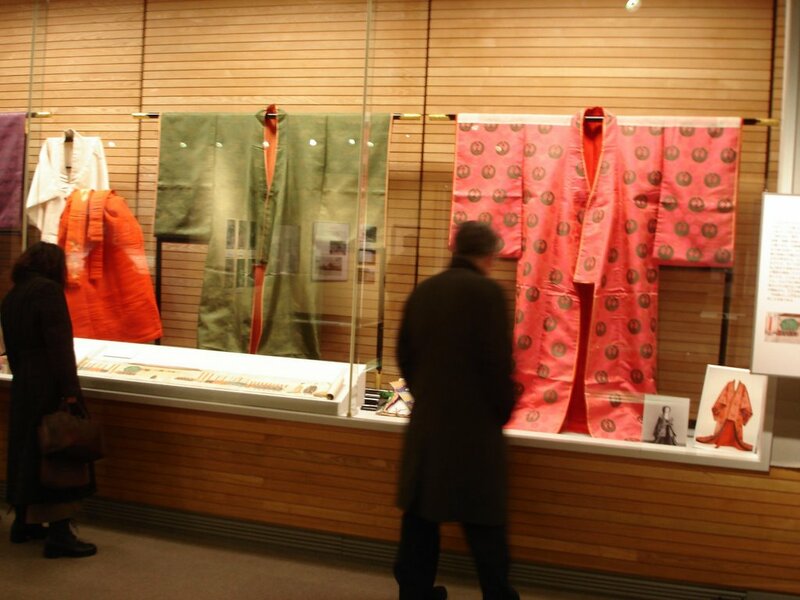 The Tobacco and Salt Museum is holding a special exhibition of the personal effects of Princess Itsuko of Nashimoto. Born in Italy in 1882, she was the daughter of Nabeshima Naohiro, the 11th of the Nabeshima line of Saga daimyos. 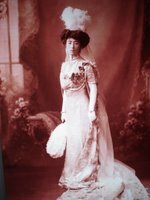 Her mother, the formidable Marchioness Nabeshima, was one of the belles of the Rokumeikan (one of her ballroom gowns is on display) and later the president of the Japan Red Cross. At 19 Itsuko, one of the most beautiful women of her time, married the watsoneseque Imperial Prince Morimasa of the Nashimoto line. The marriage united two of Shibuya's wealthiest families (The Tobacco and Salt Museum is located in Shibuya, perhaps the sole reason why the museum is hosting the exhibition. Nothing in Princess Itsuko life is in any way related to tobacco or salt). Prince Morimasa was an Imperial Army man. He was later to be imprisoned in Sugamo as a war criminal (a copy of the 1945 Asahi Shimbun announcing his arrest is on display). The Nashimotos had two daughters. 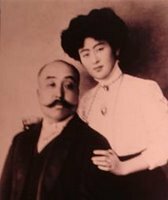 In 1920, the elder daughter, Princess Masako, was selected to become the wife of the pathetic Yi Eun, the last crown prince of the Yi dynasty of Korean kings--purportedly because Masako (Yi Bang-ja) was assumed to be barren. As photos in the exhibition show, she was not--though her first born was to die--poisoned--at age of two during a family visit to Korea. 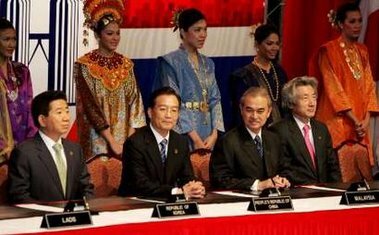 One of the photos is a an almost parodically stuffy photo of the Nashimotos with Yi Eun and Masako flanking her parents. The Nashimotos lost almost everything in the incendiary bombings of 1945 (the Nabeshimas, for their part, lost most of their personal effects in the 1923 earthquake) so the exhibition is a charming mishmash of odd bits of things that survived. Among the more interesting objects is a silver bonbonniere in the shape of a torpedo, with the imperial crest upon it in gold. One can also hear the Columbia Records recording of a song Itsuko wrote about Manchuria. I learned things I should have already known. For example, the Annex of the Akasaka Prince Hotel is the former official residence of Yi Eun and Masako. Stripped of their nobility in 1947, Morimasa and Itsuko lived on in Shibuya as commoners. Morimasa died in 1951. Itsuko lived on a further quarter century, passing away in 1976 at the age of 95. The exhibition has a photo of Itsuko participating in the 1975 celebration of the 100th anniversary of the establishment of the Shibuya #1 Elementary School. A piano that Morimasa and Itsuko had donated to the school is also on display. The exhibition runs until January 15. Admission to the Museum is 100 yen. There is no additional charge for the special exposition. OK, so we had the little business with the pen. Despite himself, Wen Jiabao broke character, allowing the most nervous of smiles to crease his lips for a moment in response to Prime Minister Koizumi's naked gambit. 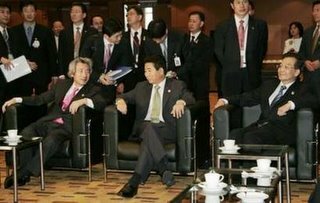 Wen Jiabao had better watch out: he has been photographed acknowledging that Koizumi was right next to him! An emir had a daughter whom he loved dearly. "Such a treasure as this," he thought as he looked upon her, "can only be given to a great and cunning hero." All the eligible young men were summoned to the courtyard of the palace. In the center of the courtyard they found a massive cast iron cage, with a great brass key in the lock. "Out in the desert there is a gigantic lion. The people call him Al-Jabbar. Many have set out to kill or capture him. Not one has returned. I will give my daughter in marriage to the one who puts Al-Jabbar alive in this cage." The young men were astonished. "It can't be done," some shouted. Many hung their heads and began to shuffle home. The most foolhardy or greedy ran to the market to buy weapons and rope. Just then the son of the court mathematician got up from where he was sitting and walked up to great iron cage. Pushing with all his strength, he opened the great door. Then to everyone's surprise, he climbed inside the cage, closed the door behind him, locked the door and put the key in his pocket. 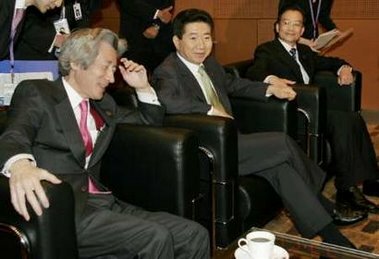 "Now," he declared in a confident voice, "Given the initial assumption that I am outside the cage..."
Prime Minister Koizumi seems to want to be the court mathematician's son as regards Yasukuni. "A single issue should not affect relations," he harrumphs as the leaders of China and South Korea continue to shun him. In Koizumi's view, Roh, Hu, Wen and anyone else unhappy with his visits to Yakukuni should just swallow their respective prides and take it....especially since Mr. K will be going to Yasukuni again in 2006. Wouldn't be nice if we could just declare certain topics off limits and not have to deal with them anymore? What a wonderful, wonderful world it would be. Indeed, I think everyone should have the right to unilaterally declare a small number of unpleasant topics off limits. For example, when my employer calls me into his office next time, I think I should have the right to say, "Stop right there. My not doing as you instructed should not be the basis of our conversations today." Oh, what happened to the mathematician's son? He and the princess were soon wed and they lived happily together until the end of their days. At least that is the story the mathematicians tell. Photos courtesy of Reuters, AP and AFP. 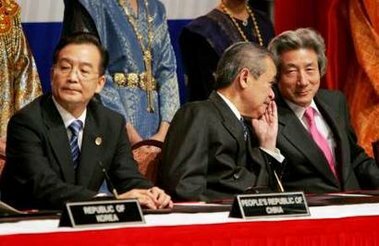 "Hey Roh, did you hear the new Chirac joke? Chirac and Sarkozy are walking down the street..."
"Just then Sarkozy says, 'That's not the phone number of his mistress! Those are the GDP figures!" 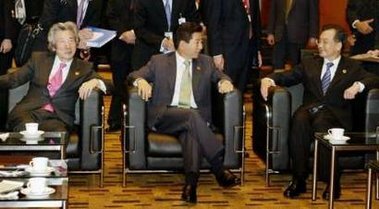 "Gosh...at the G8 they loved that joke." "Right, right, right...nothing is happening to my left. Nothing at all. The right side of the room is just so fascinating. Hmmmmm, end of the table down there...hmmm, just so interesting." 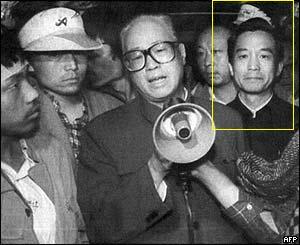 "Psst, Comrade Wen, you're showing your discomfort again. When you-know-who's in the frame with me, I just do my 'Dead Guy in a Light Green Tie' act. "Ladadada, he's not here. Keep smiling...keep smiling...Keep facing right...He's is sooooo not here."